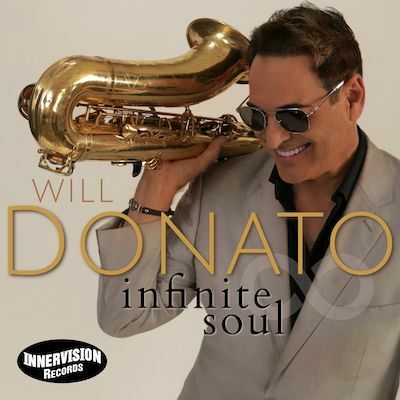 ALISO VIEJO, Calif. - Jan. 7, 2019 - - Groove Jazz heavyweight Will Donato showcases his recognizable, soulful, signature saxophone sound with a new, contemporary, deep groove in "Infinite Soul" produced by the talented keyboardist Greg Manning. The new single is from the forthcoming album of the same name due out this summer. Donato will also be a featured artist at the Innervision Records 6th Annual After NAMM JAMM concert at the premiere smooth jazz performance venue Spaghettini Grill and Jazz club in Seal Beach, CA. The event promises to be even bigger than last year featuring Special Guests: Blake Aaron, Will Donato, Aysha, Dean James, Blair Bryant, Dee Brown, Greg Vail, Preston Smith, Craig Sharmat, Neamen Lyles, Jon Dalton, Darryl Williams, Dave Hooper and Mike Whitaker! The concert follows the world famous NAMM (National Association of Music Merchants) show at the Anaheim Convention Center where members of the music industry gather from around the world to present products, education, applications, showcases, live performances, networking and more. The four day event attracts over 100,000 attendees. Innervision Records http://www.innervisionrecords.com is an innovative record label with a special focus on operating within the ever-changing music industry and revolutionizing the way the artist-label relationship works. Innervision specializes in Groove/Smooth Jazz, Jazz, Chill , Neo-Soul and World Music. Innervision is dedicated to infusing fresh, new styles of music, and raising the level of the music you hear by bringing your airwaves, internet and satellite radio great independent music created by artists with a passion for music. This passion, coupled with Innervision's rejection of the music industry's corporate model, enables Innervision Records to bring unique and refreshing music to the masses.